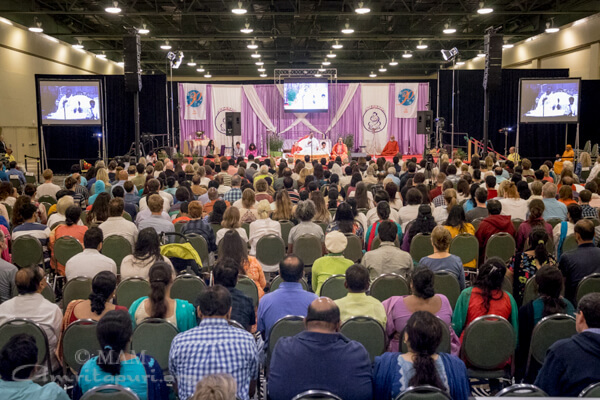 On the way to the Dallas programs, Amma stopped at the new MA Center in Aubrey, TX just north of Dallas. 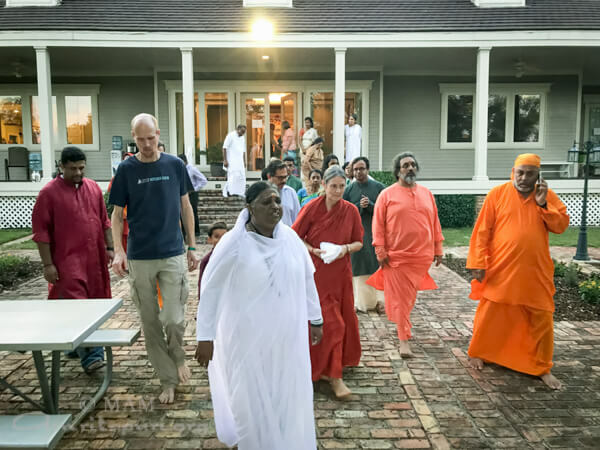 Located on a 50-acre plot of picturesque property in what is known as “Horse Country USA”, the center includes a ranch house and a scenic pond. 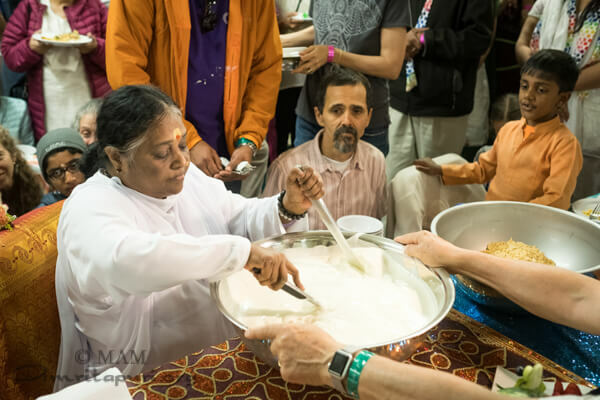 Local devotees were overjoyed as Amma served everyone dinner, sang bhajans, and meditated by the pond. 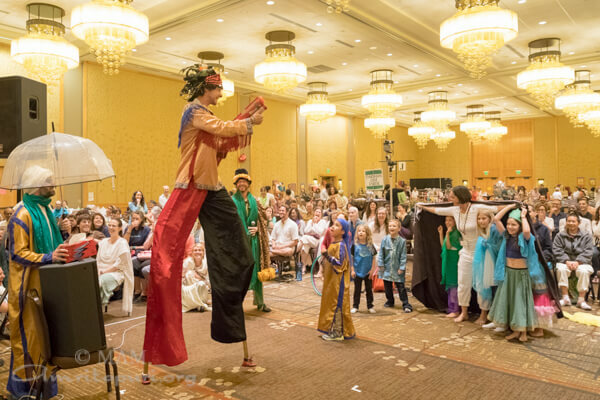 The public programs were held at the enormous Hilton Anatole hotel in downtown Dallas. 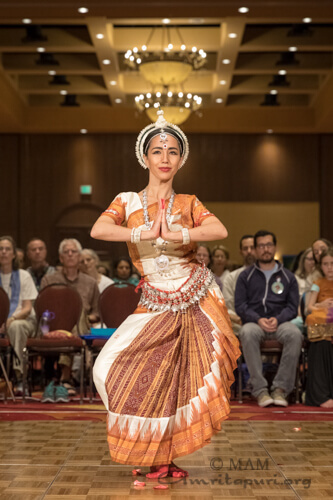 Beautiful artwork from the Far East lined the corridors of the hotel and a small water park complete with slides and a wading river provided additional entertainment for attendees between programs. 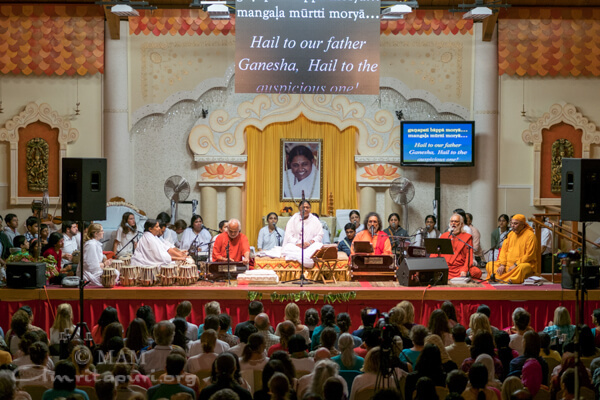 During the programs, Amma gave Satsang, sang bhajans, and gave darshan. 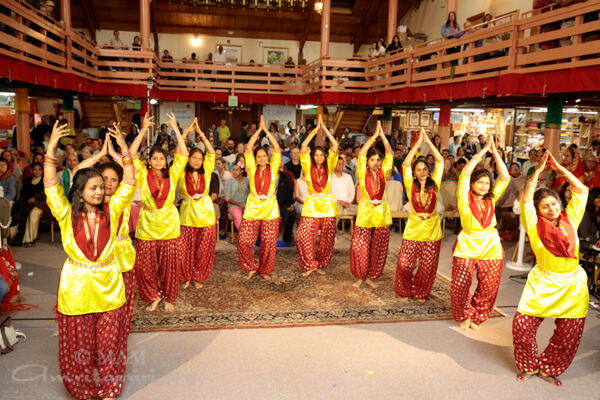 Local devotees offered a number of cultural performances including traditional Indian dancing. 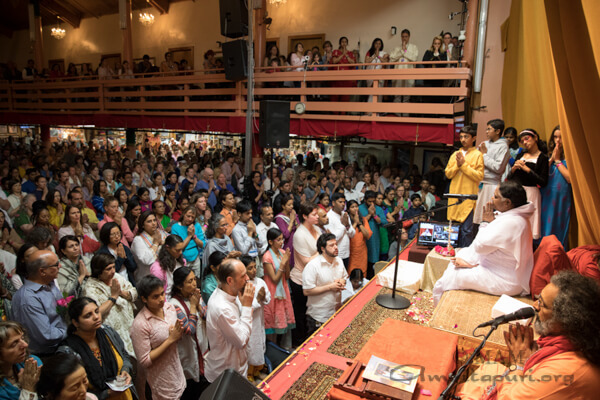 While addressing the crowd, Amma reflected on the need for stabilizing the human mind, where all acts of violence and hatred have their origin: “While natural disasters may not be under our control, we do have technology that can signal us as they are approaching. 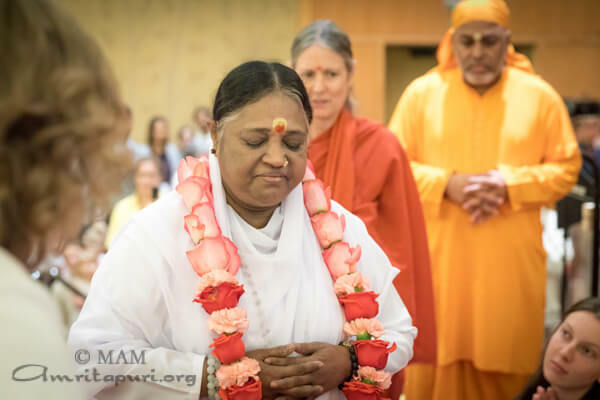 However, science has yet to invent a device that can detect the disasters man carries in his mind.” Spirituality, as Amma has taught throughout her life, is the science of managing the mind. 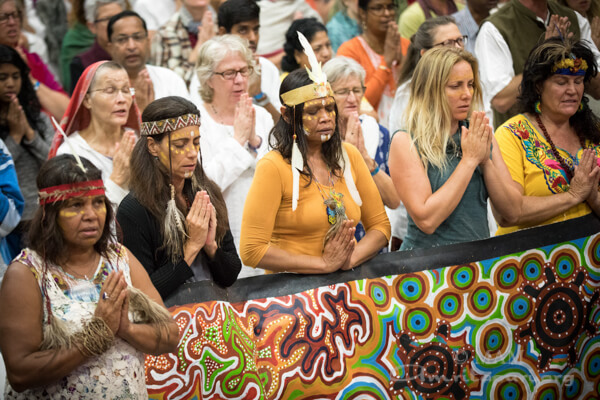 In today’s world, this science is needed more than ever before. 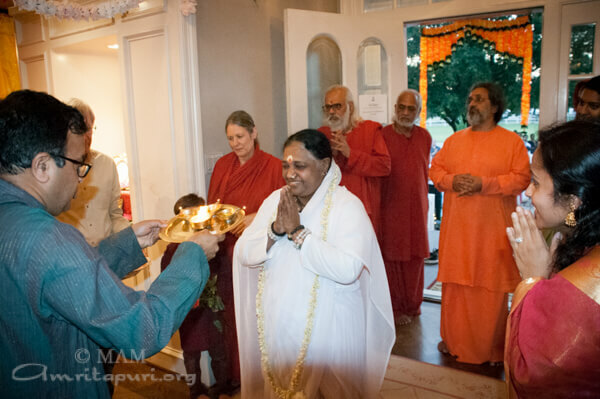 Continuing the celebrations of honoring Amma’s 30th visit to the US, a small ceremony was held on the second evening before Devi Bhava. 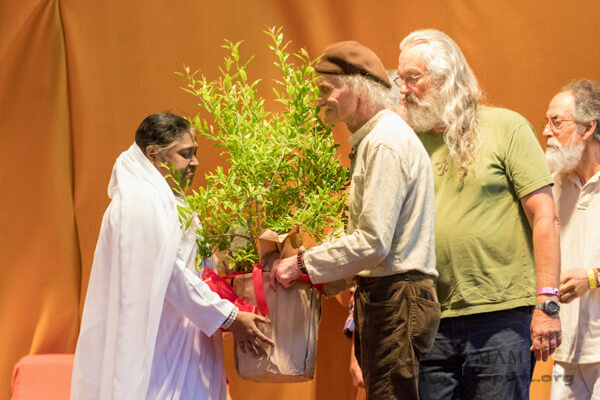 Jeff Warren addressed the crowd as a group of local devotees who had first met Amma 30th years ago offered flowers at Amma’s feet. 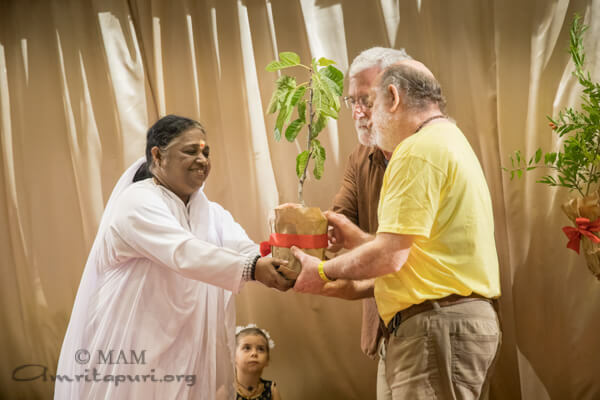 Two saplings were blessed by Amma which will be planted at the new Ashram. 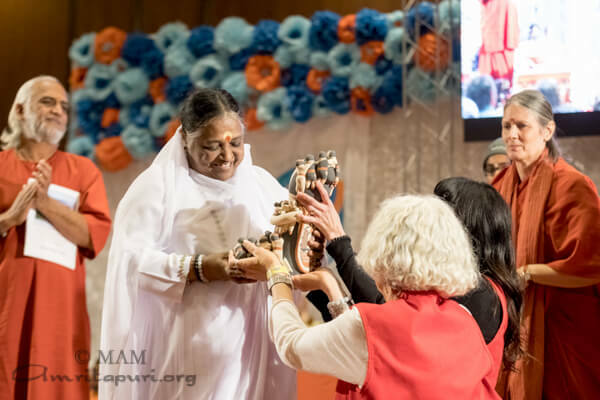 Amma began the first day program with satsang and meditation. 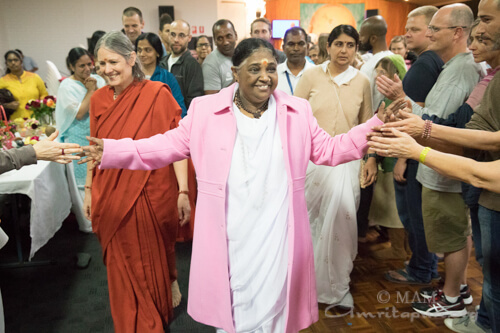 Before darshan began, Amma sang a bhajan and asked everyone to stand up and dance. 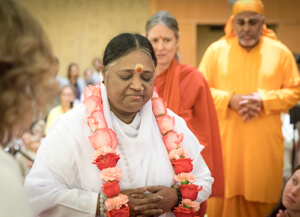 Many devotees were wearing special buttons commemorating Amma’s 30th visit to Santa Fe. 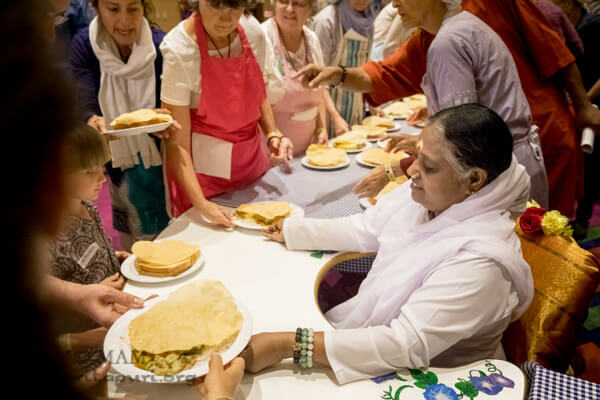 The second night of the retreat began with a meditation and Q&A session followed by Amma serving everyone dinner. 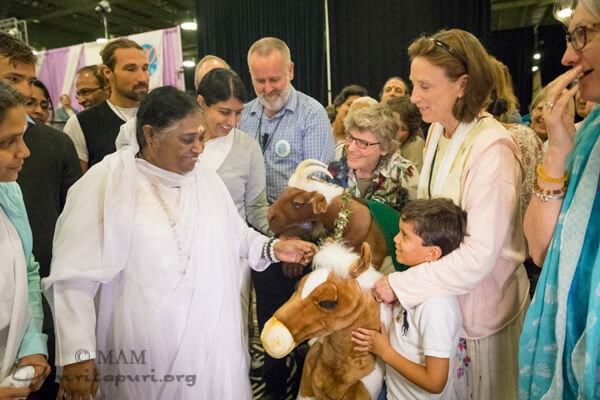 Just after bhajans and Arati, local tour organizer Kristen Speakman welcomed Amma. 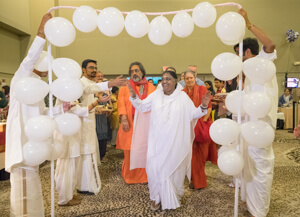 “ We are so grateful and honored to be celebrating Amma’s 30th Anniversary of coming to New Mexico.” Amma was then garlanded by Kusuma Venkatesh, (who organized the first tour in 1987, and Steve and Amritapriya Schmidt who first hosted Amma in Santa Fe, and who have been instrumental in the development and operations of the Amma Center of New Mexico. 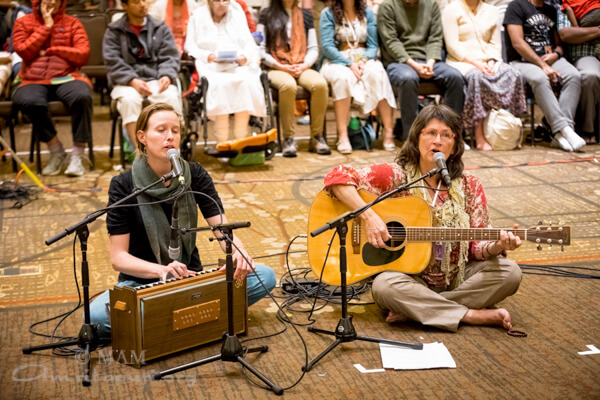 The second night of the retreat included many cultural performances. 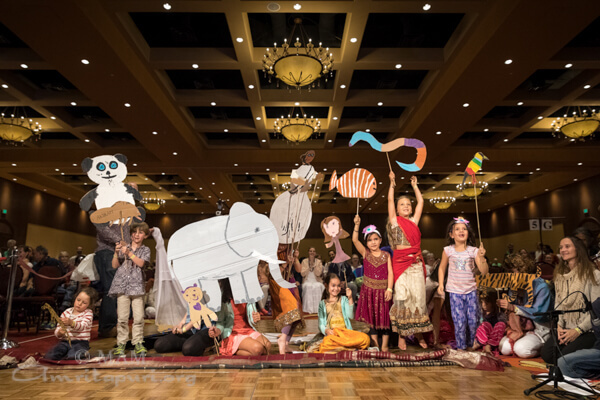 Local children put on a play using cardboard animal images they had made themselves. 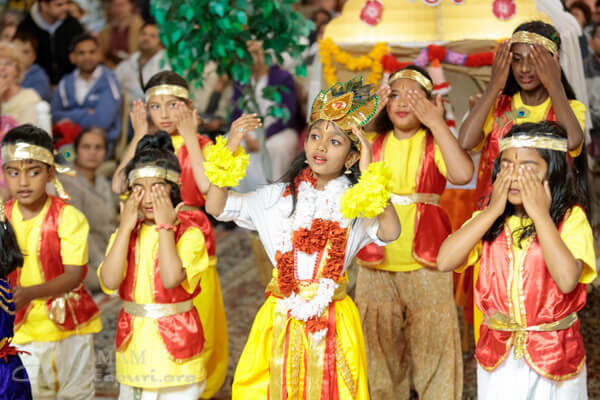 The story told how the animals were sad because of the harm humans were doing to the Earth’s climate. 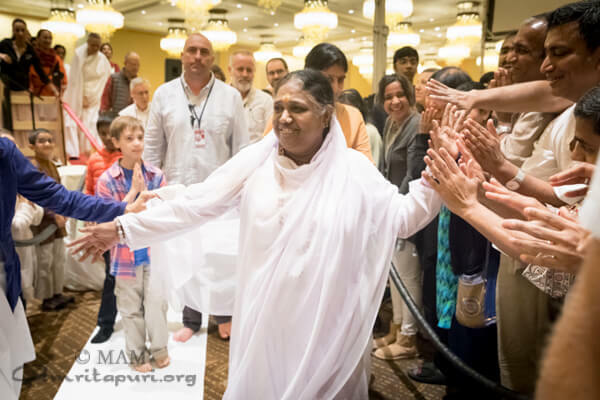 A young girl saw their suffering and told them that if they prayed to Amma, perhaps humans would change their ways. 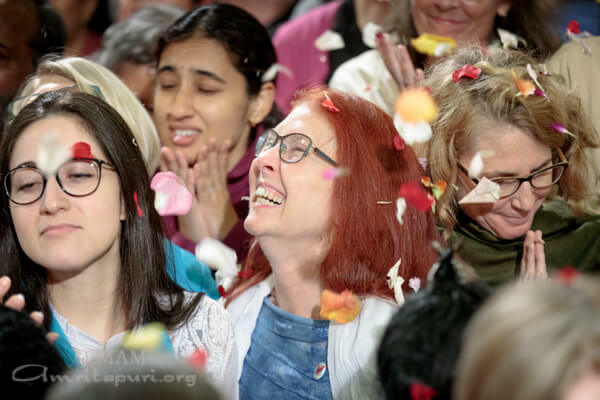 Their prayers were indeed heard, and the environment and climate became healthy and everyone was happy. 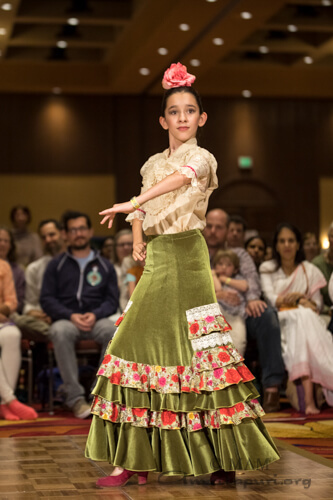 Other cultural performances included a Flamenco dance, and a beautiful violin solo. 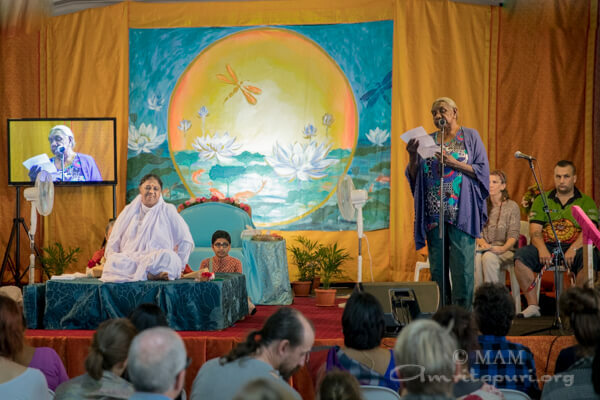 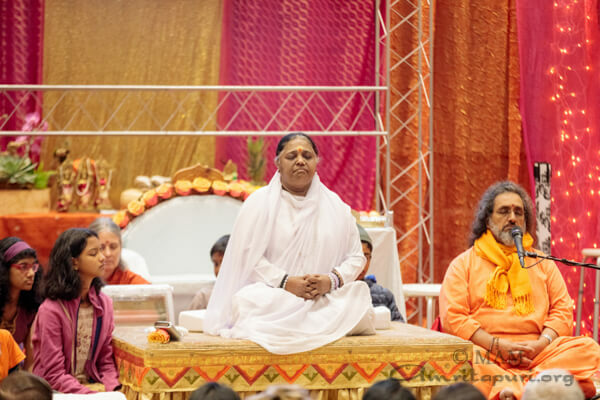 Amma held three days of public programs in Los Angeles, concluding with Devi Bhava on the last night. 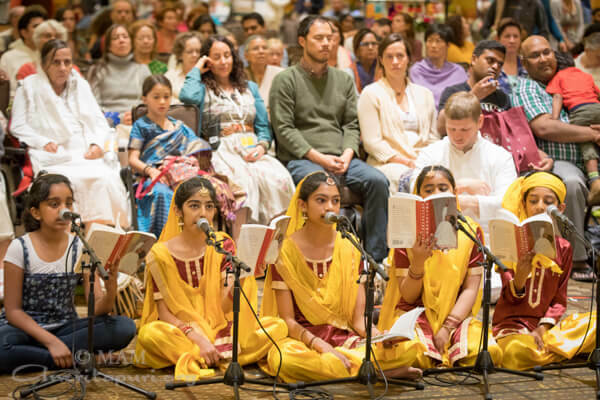 Cultural performances included local devotee children singing bhajans, as well as a beautiful flute and harp performance. 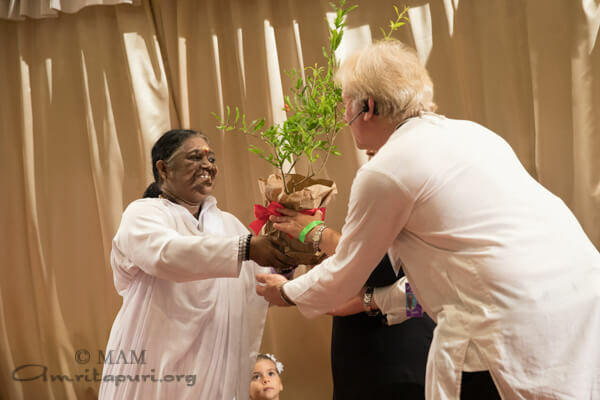 During special ceremonies to celebrate Amma’s 30th visit to the US, Amma blessed two saplings which will be planted at the Los Angeles Ashram. 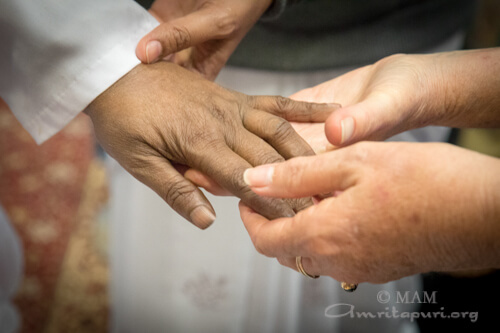 Local devotees who had first met Amma 30 years ago were invited to come and offer flowers at Amma’s feet. 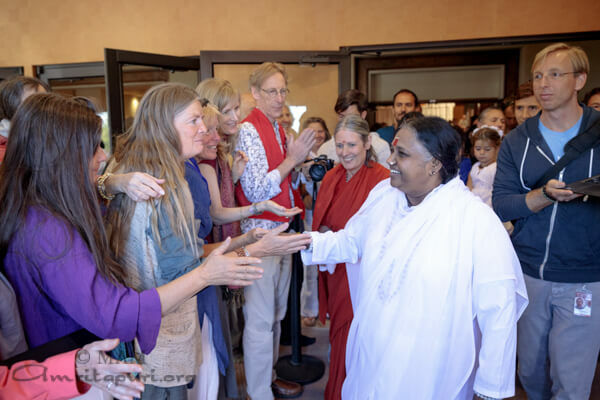 After Devi Bhava ended, Amma left for the long drive to Santa Fe, New Mexico, USA. 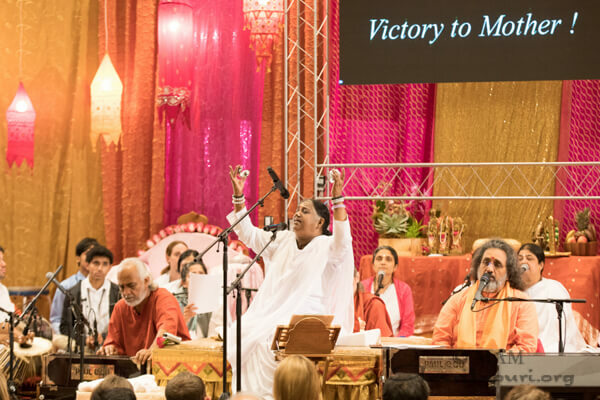 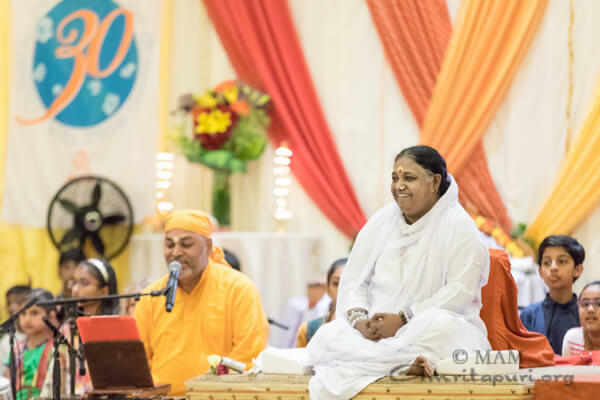 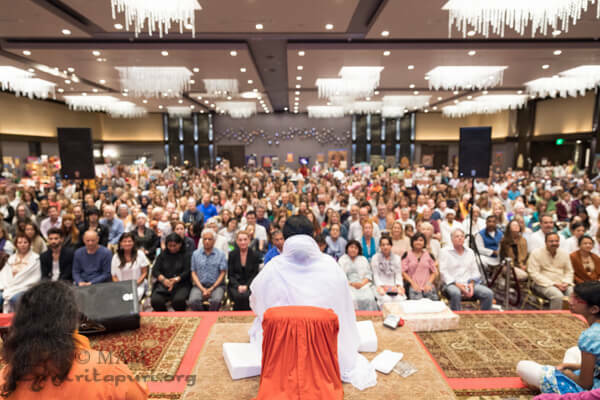 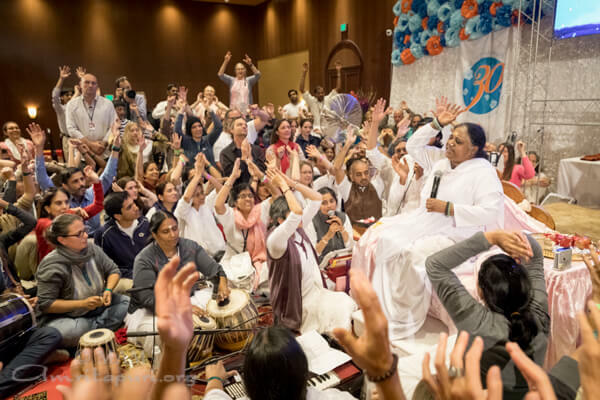 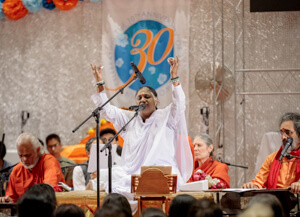 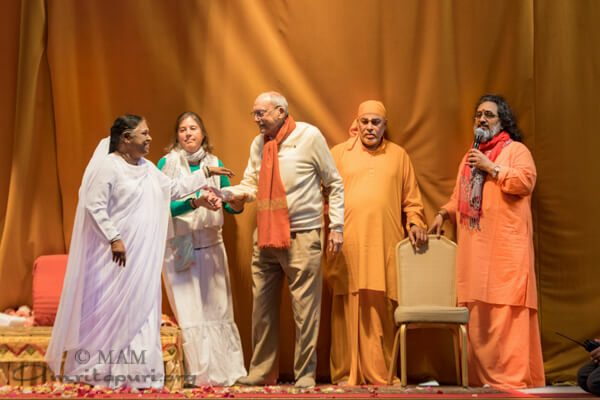 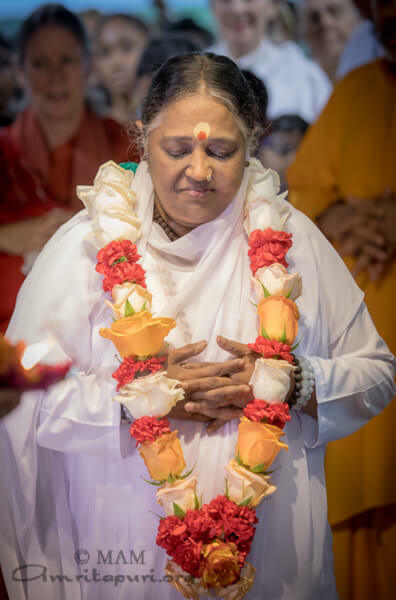 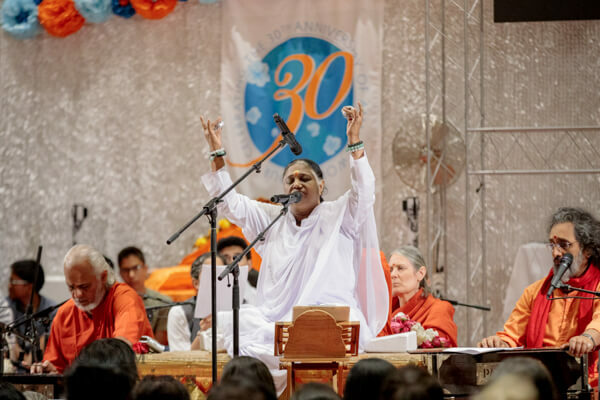 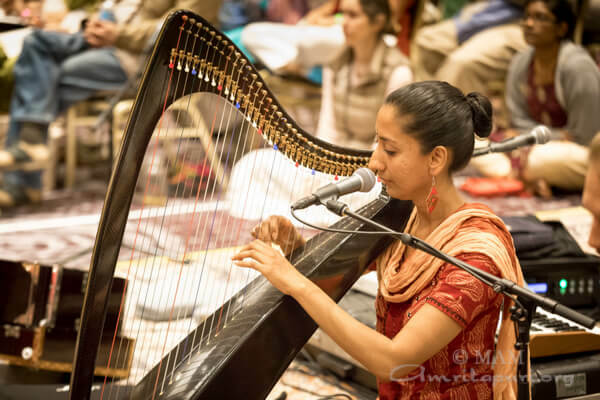 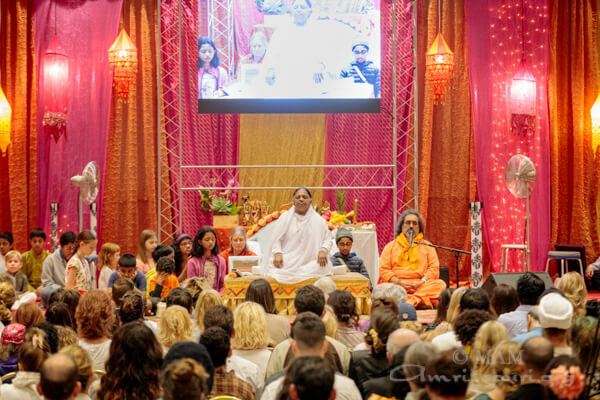 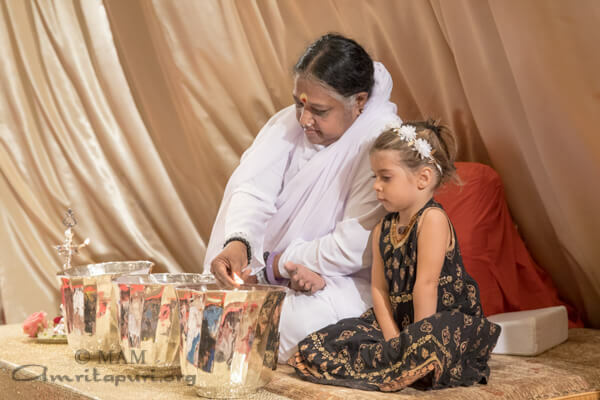 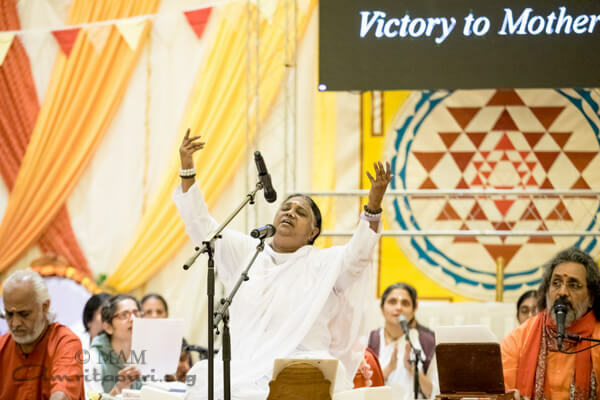 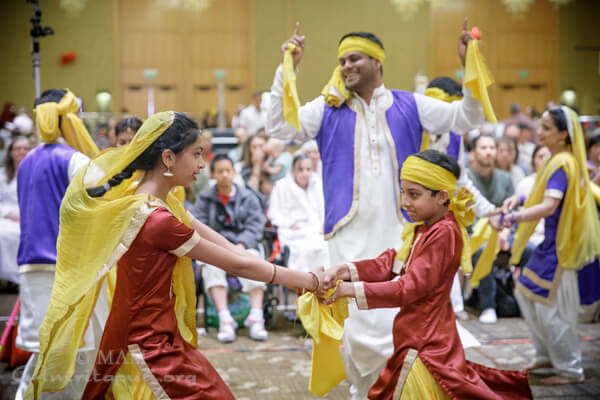 At MA Center in San Ramon, California, in honor of the 30th anniversary of Amma coming to the Bay Area and to the United States, devotees held a special ceremony commemorating the moment. 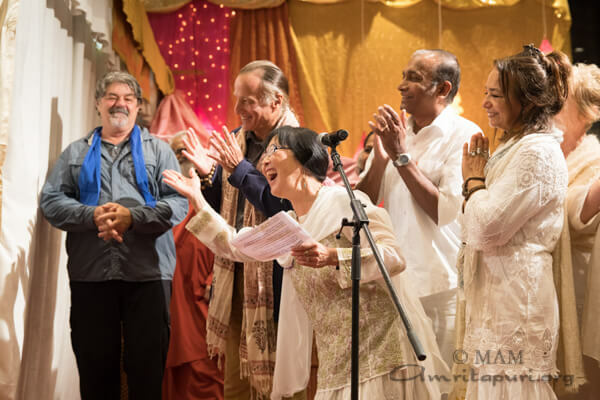 On stage for the occasion were Ron Gottsegen, MA Center President, and Kusuma Gretchen Venkatesh, who organized Amma’s first world tour in 1987, traveling the world in 1986 and 1987 before Amma had ever left India, with just an 8 mm videotape of Amma and her own experiences of living with Amma in the then-very small Amritapuri Ashram. 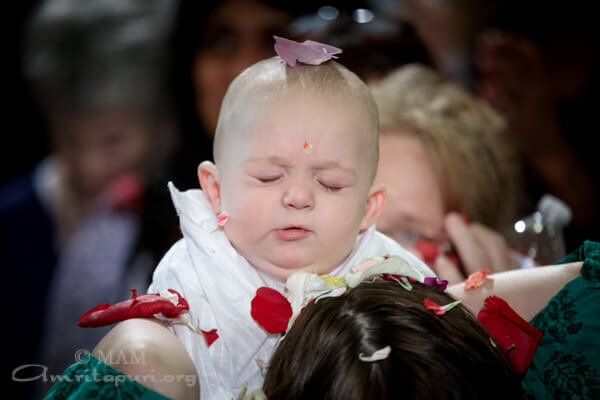 Also on stage were a number of devotees who had met Amma as babies or very small children, and are now grown adults. 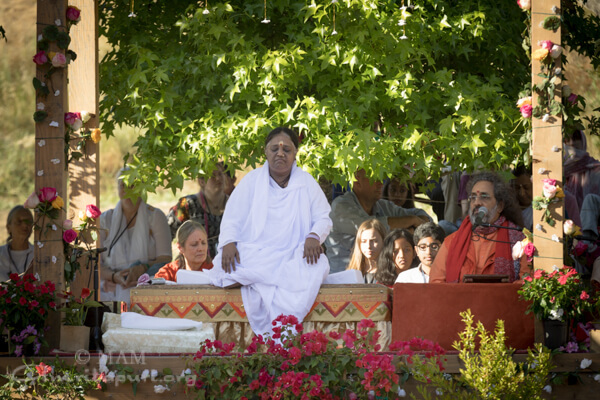 Ron Gottsegen opened the ceremony, saying, “Tonight has special significance because it marks a special occasion. 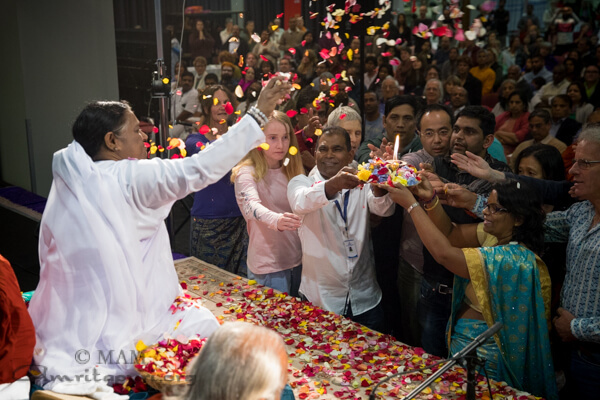 his year marks the 30th anniversary of Amma coming to North America. 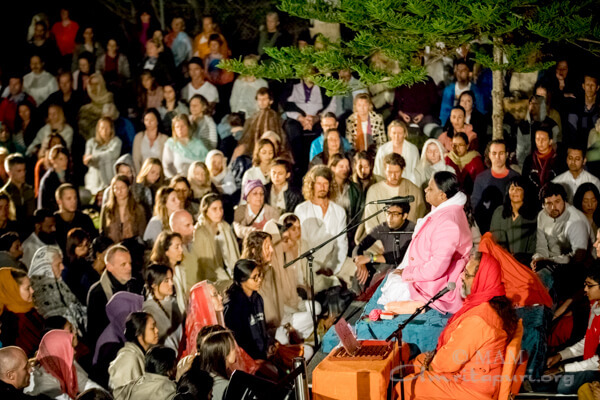 It began in 1986 when Amma told her disciples, ‘My children are everywhere. 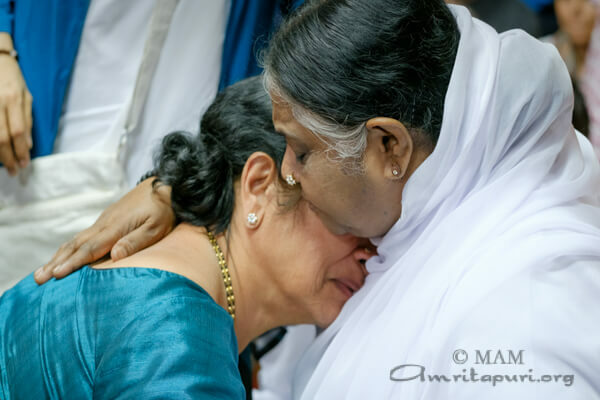 They are crying for Amma, but cannot find me. 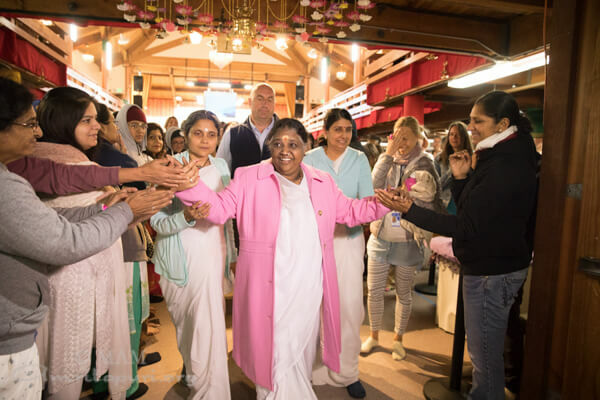 Amma must go to them.’ And thus, Amma began her first World Tour, landing at San Francisco International Airport on May 18, 1987–30 years ago. 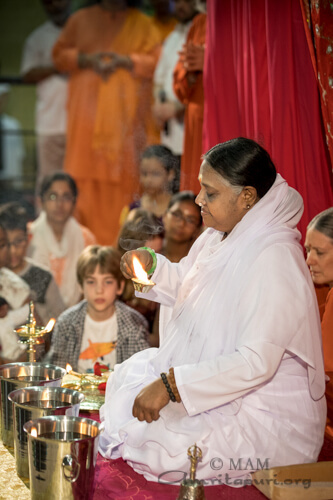 “It is because of Amma’s immense love, compassion and selflessness that that she comes back to us each and every year. 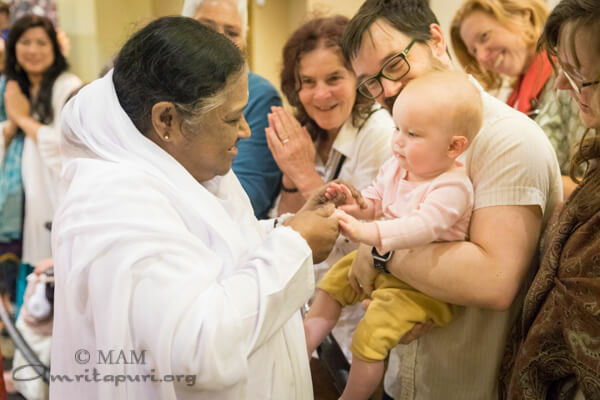 As Amma says, ‘An unbroken stream of love flows from Amma to all beings in the universe.’ For 30 years now, we have been the recipients of this love. 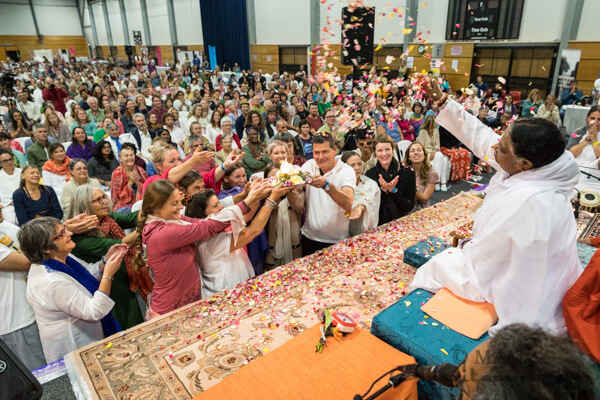 And, on behalf, of all Amma’s devotees in the North America, I would like to offer Amma, our immense reverence, thankfulness and gratitude. 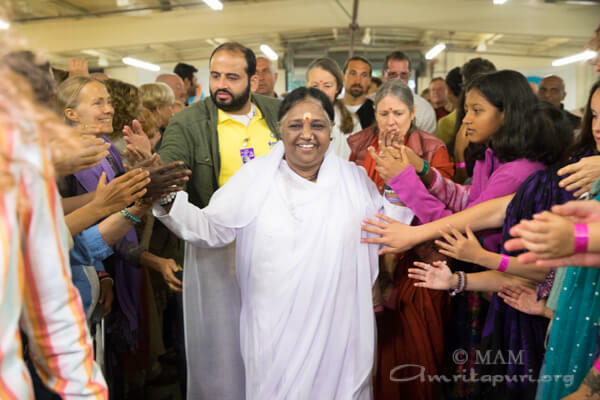 “Amma has transformed the lives of everyone who has come to her. 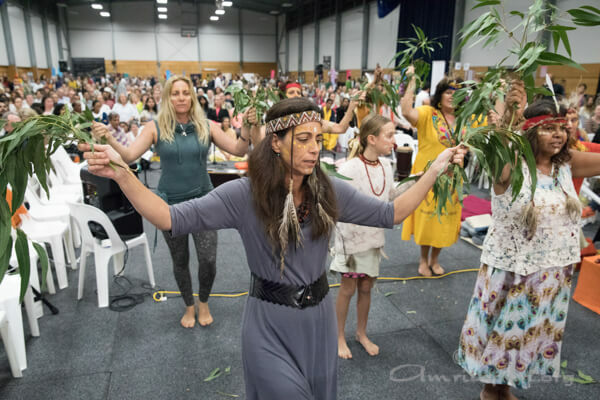 In this hall there are three generations of people “ said Ron Gottsegen. 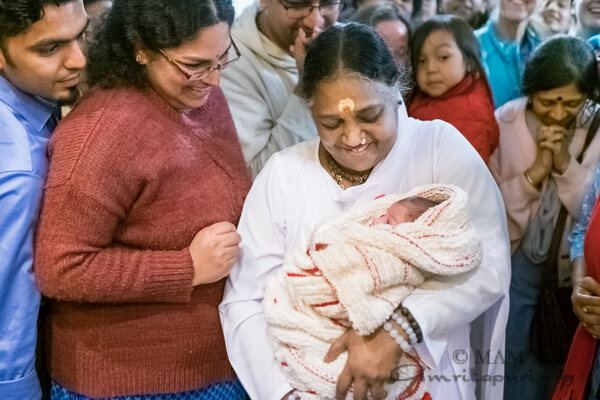 He then invited Neela Penumarthy, one of the young devotees, who met Amma on her first visit as an infant 30 years ago,to share a few words. 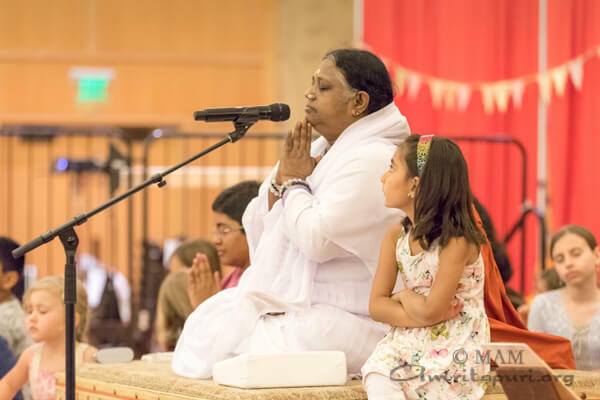 Speaking on behalf of those who have grown up with Amma, Neela shared, “This year marks the 30th anniversary of Amma’s visit to the Bay Area. 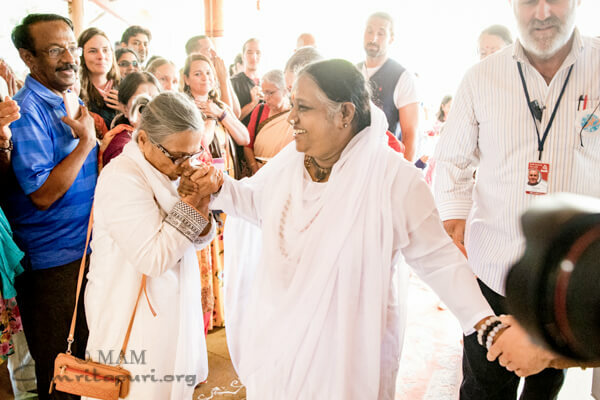 Her visits here, while filled with sacred sweetness, only comprise a small part of her gift to us. 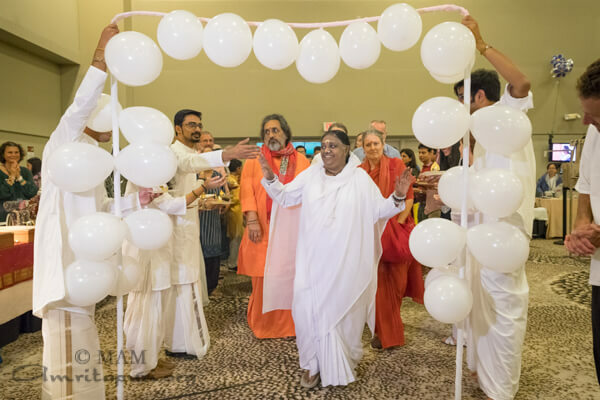 In many ways, the San Ramon Ashram is an extension of her presence, and has been the source of great joy and community for so many. 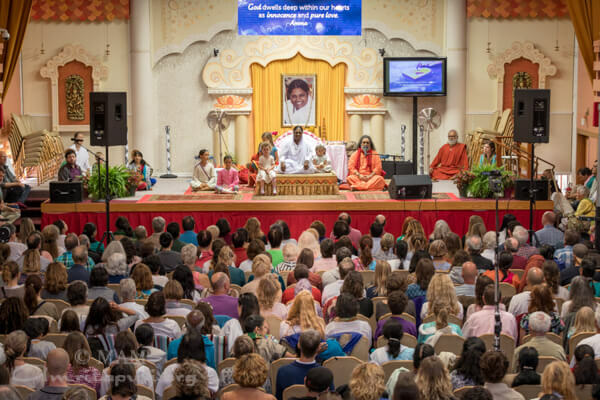 Many of us have learned to crawl and walk on these very grounds, and this space feels like our truest home. 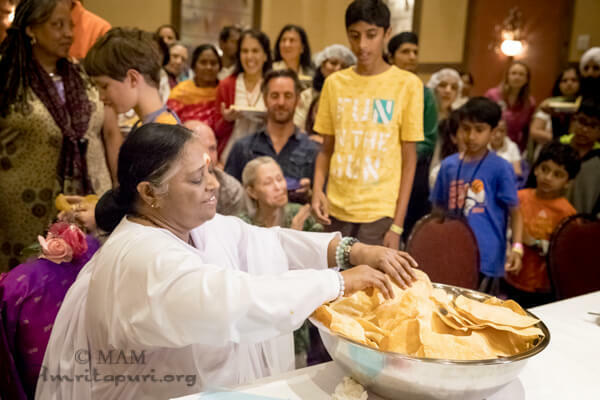 “Amma’s dream for humanity is a simple one: That people will be able to eat to their fill. 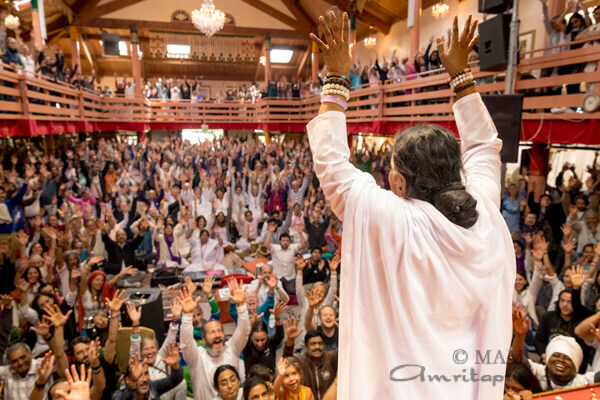 That there will be a day without violence. 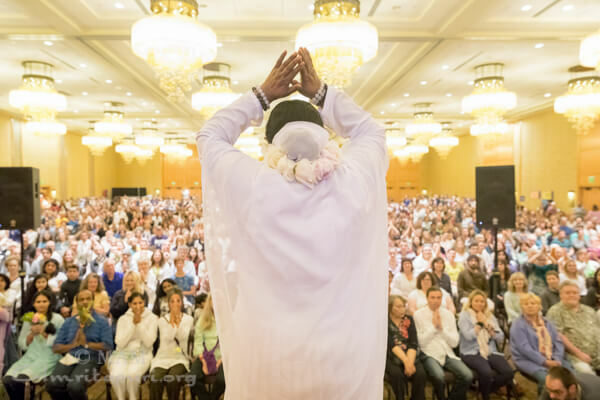 That individuals will be able to sleep without fear. 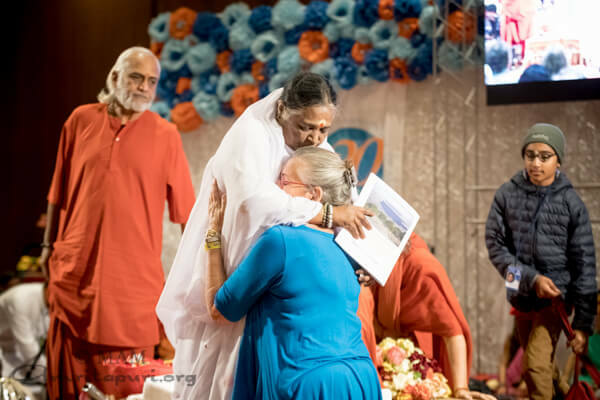 And for her children to serve the poor and needy. 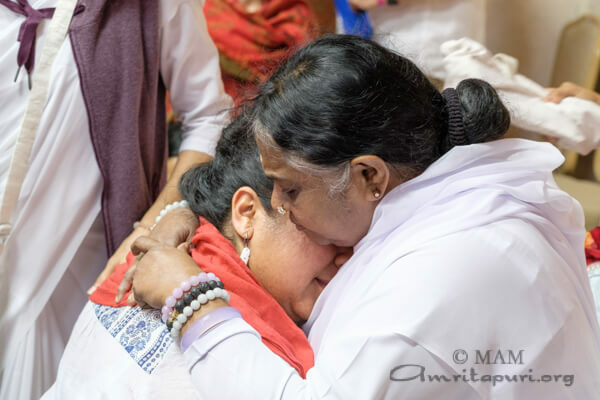 “Regardless of when we met Amma, in honor of Amma’s presence here, we can recommit to instilling even our most mundane interactions with this spirit of compassion, Amma’s very spirit. 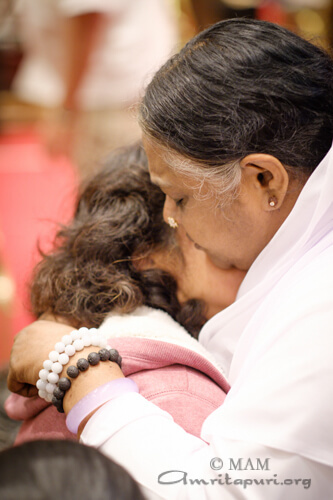 We can reach out to those who are suffering, be a kind presence of others, and reduce our own violent tendencies. 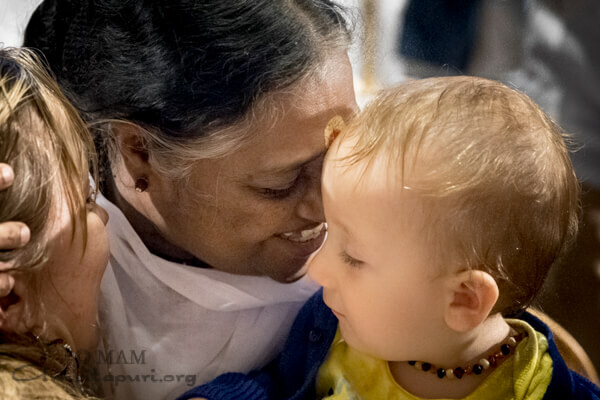 Just as Amma sees all of creation as her own, we can see the world as our family. 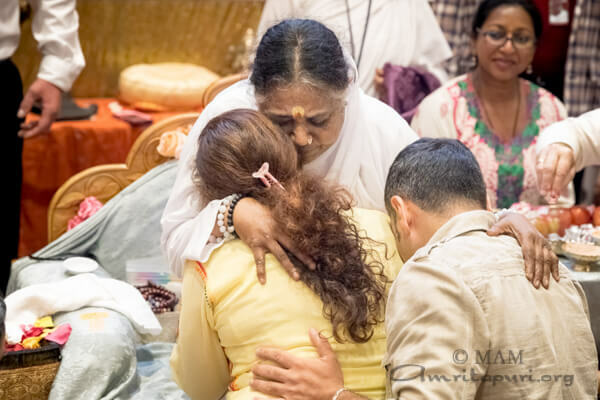 “We feel profound gratitude to be the beneficiaries of the gift of your presence, Amma. 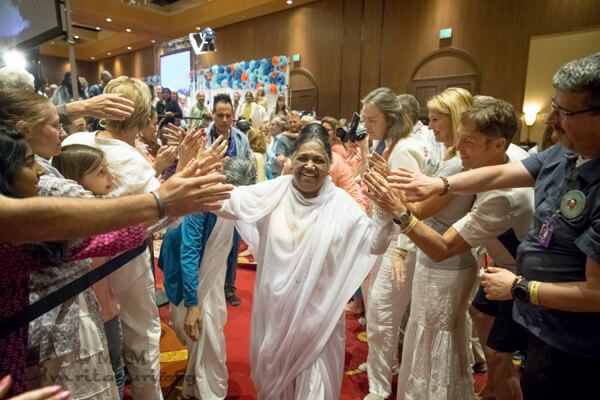 You have said many times that your children are your wealth, and we will strive to make your dream—of a loving, more compassionate world—a reality. 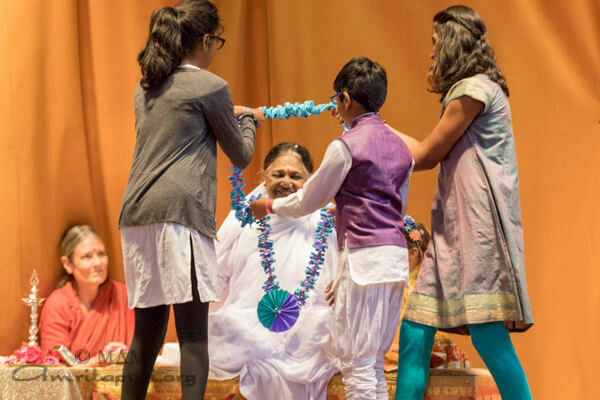 In this spirit, your children have written messages of appreciation and personal pledges to You, which have been strung into a literal garland of gratitude. 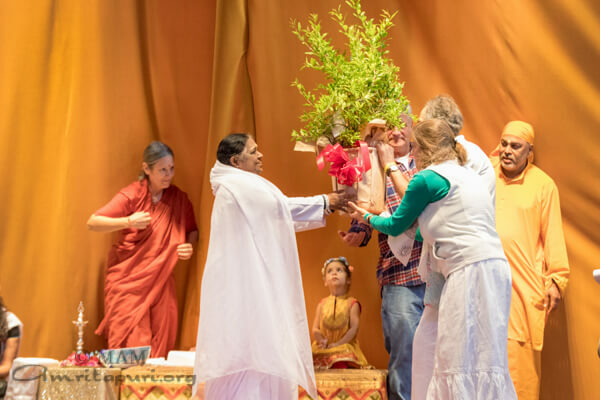 This garland of gratitude was then presented to Amma, who bowed as she received it. 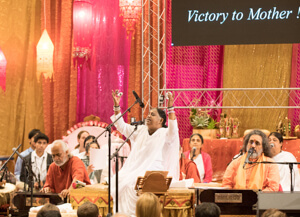 Taking the microphone, Swamiji asked the assembled crowd to honor both Kusuma, who had organized the first tour all those many years ago and laid the groundwork for all that came after, and MA Center Board President Ron Gottsegen, who donated the first ashram in the United States to MA Center, making possible what has become a sanctuary and true spiritual home for three generations of spiritual seekers. 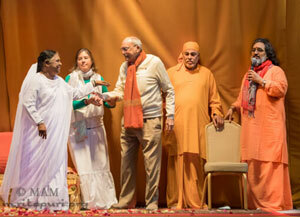 As Amma took Kusuma and Ron into her arms, the crowd roared with appreciation and gratitude. 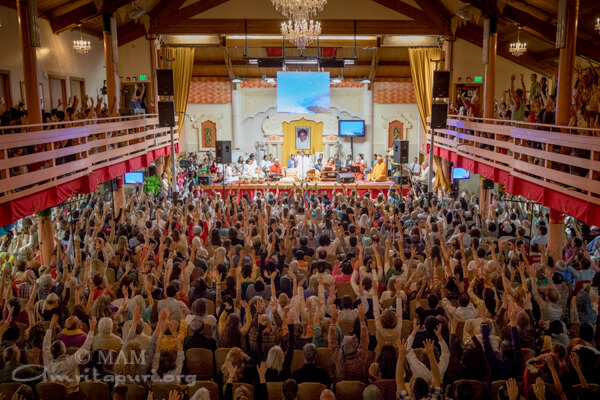 Amma held 4 days of public programs followed by a retreat at her San Ramon, California Ashram in northern California. 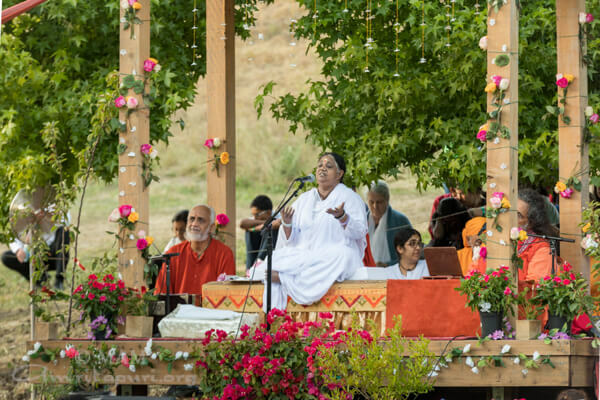 The surrounding hills still had touches of green from the spring rains as people descended upon the Ashram to welcome Amma. 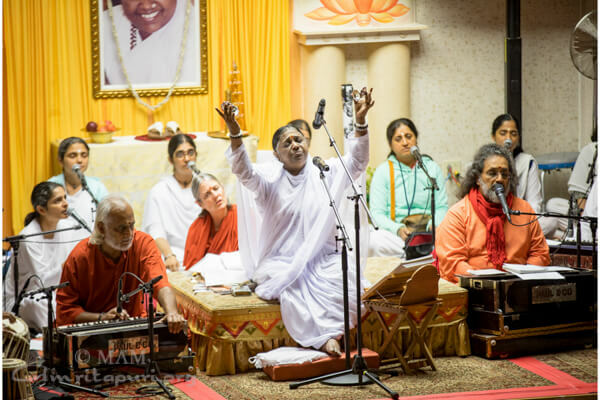 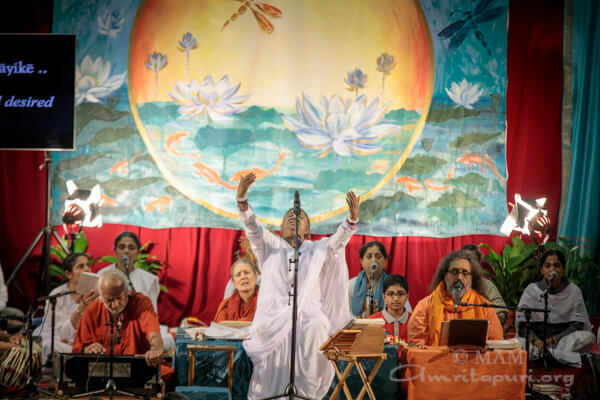 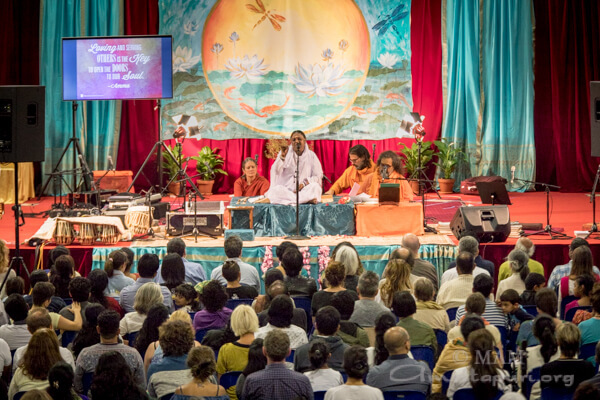 On Devi Bhava, a special ceremony was held to honor Amma’s 30th visit to the US. 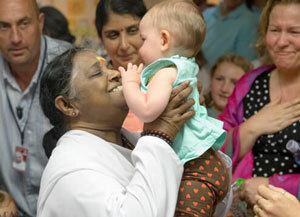 Also present were many adults who had been young children when Amma first arrived in the US. 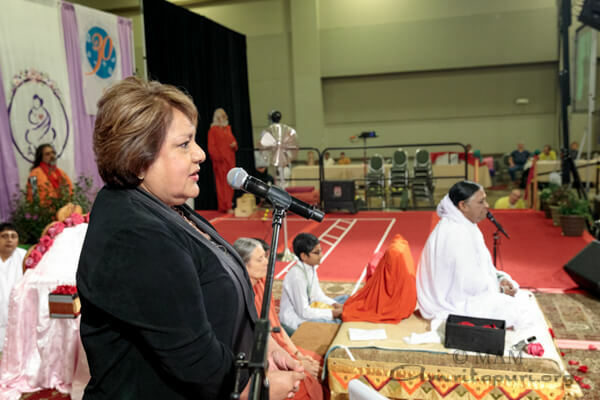 Neela Penumarthy spoke on their behalf. 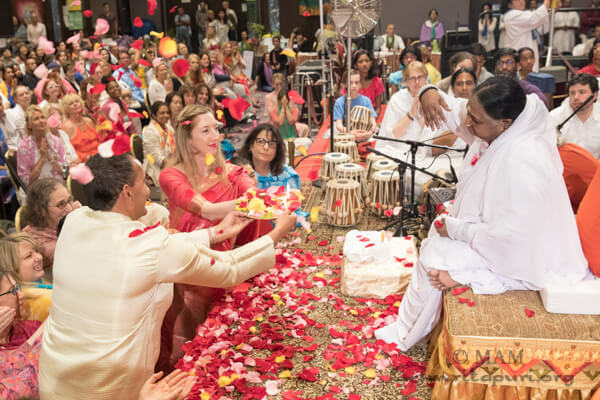 The youth then offered Amma a garland of gratitude that was strung with personal pledges and written messages of appreciation. 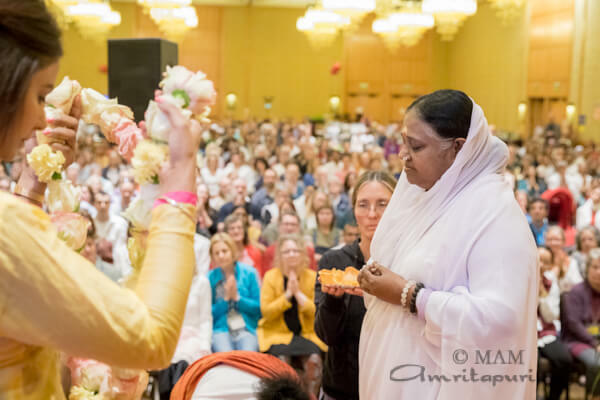 Next, a procession of devotees who had first met Amma 30 years ago offered flowers at her feet. 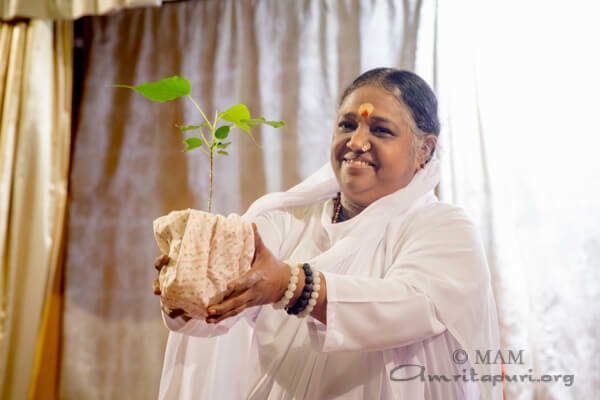 Amma then blessed two saplings that will be planted on the grounds of MA Center in honor of the milestone. 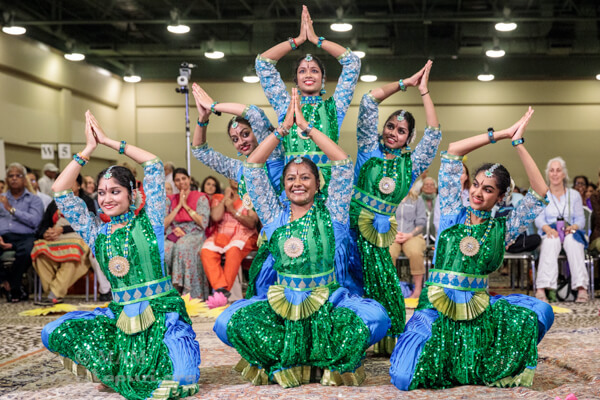 During the retreat, there were numerous cultural performances, including a play in two parts – the first depicted the story of the Tamil Saint Abhirami Pttar, while the second enacted the story of how Devi killed the demons Shumba and Nishumba in the epic battle as recounted in the Devi Mahatmyam. 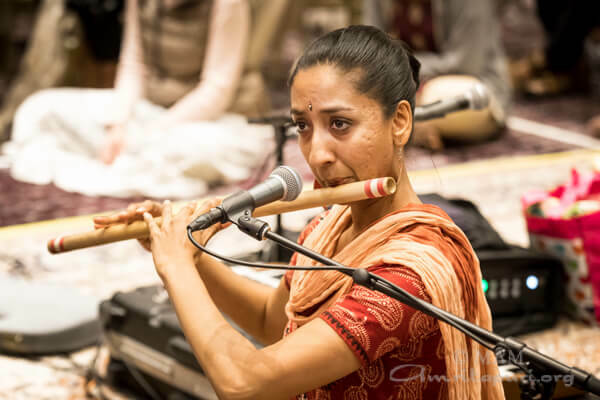 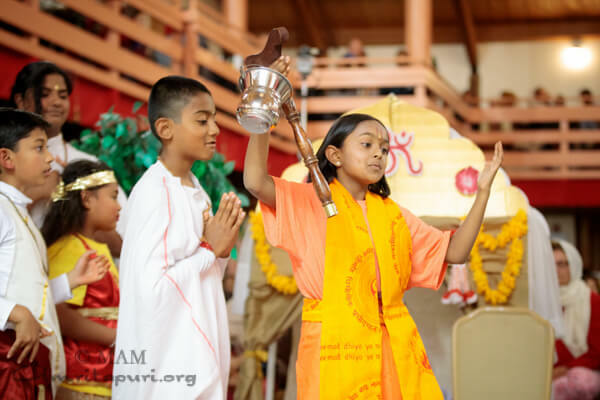 Children from the Bay Area Amrita Bala Kendra sang bhajans and put on a play about the life of Surdas, the14th century Indian blind saint, poet, and musician. 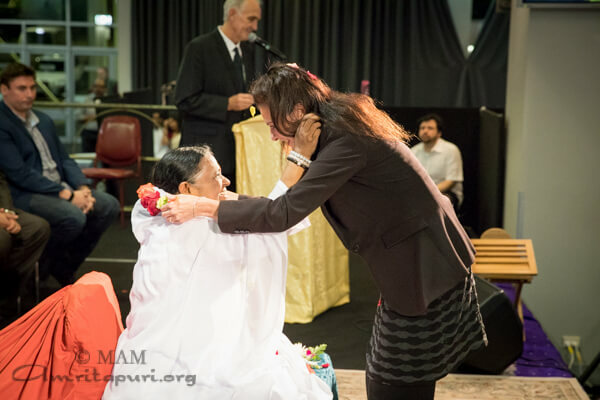 After San Ramon, Amma left for Los Angeles where the next programs will be held. 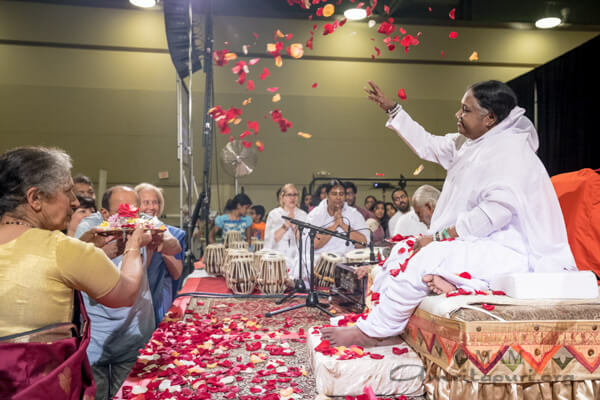 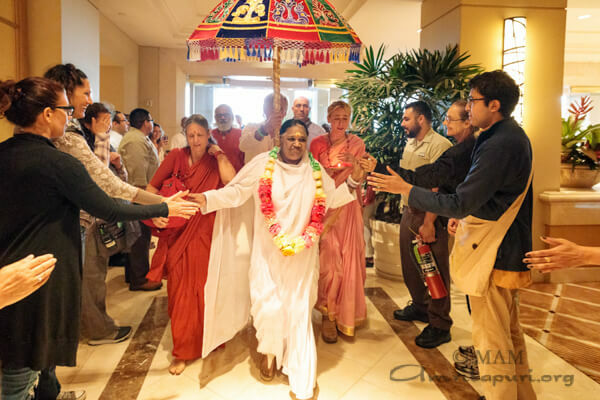 Amma began her 30th North American Yatra with three days of programs in Bellevue, Washington, USA. 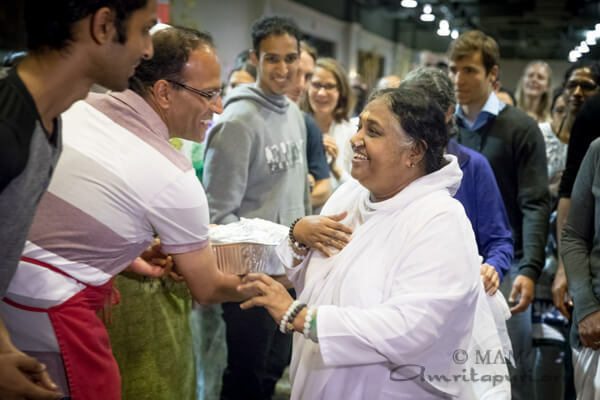 Amma went directly from the airport to the Pacific Northwest Center where she served lunch while devotees told spiritual stories and jokes. 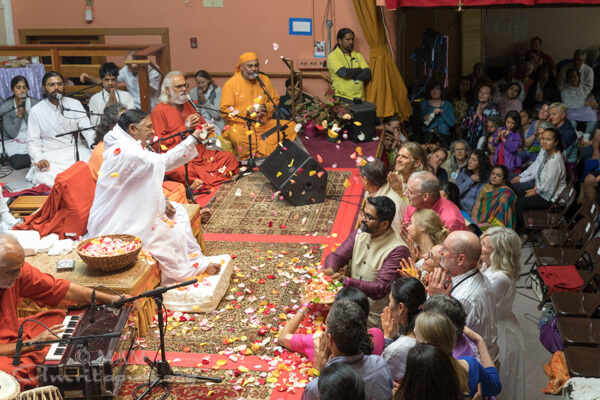 Much has changed in the past year since the Center was first formed. 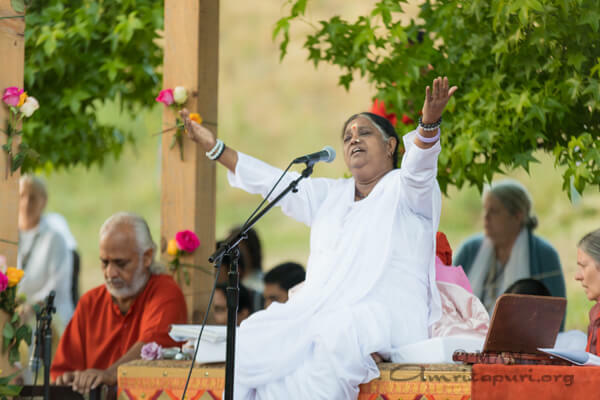 There is a beautiful garden, a meditation path, and work has just begun on a number of orchards on the 5-acre. 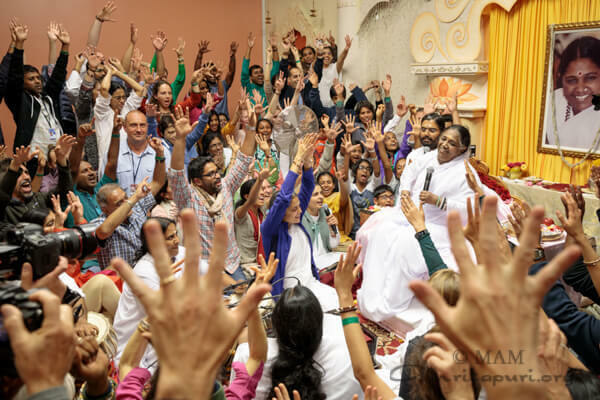 On the second day of programs, Br. 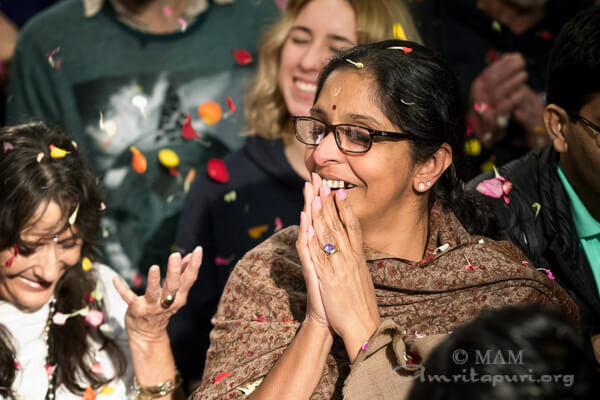 Dayamrita Chaitanya acknowledged Amma’s 30th anniversary and asked for a show of hands of all who were there in the first year. 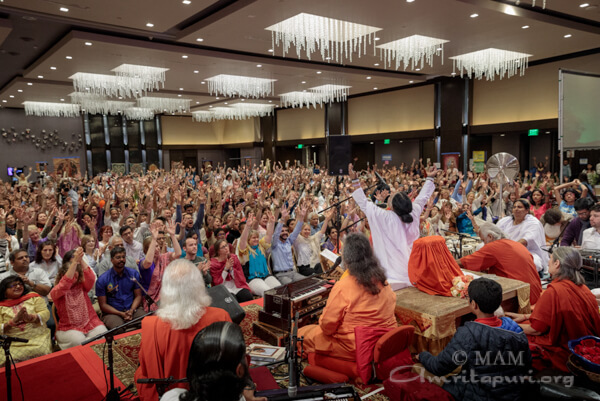 Those who raised their hands received a hearty round of applause from all the program attendees. 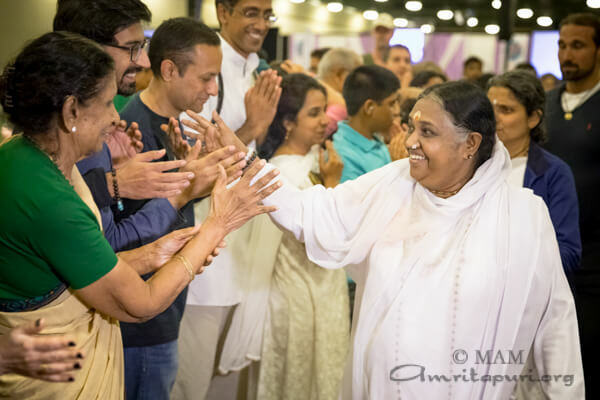 He went on to note that while many of us have traveled far to come see Amma, it is in fact Amma who has been coming to see the devotees, traveling more than 8,000 miles around the world to do so, year after year. 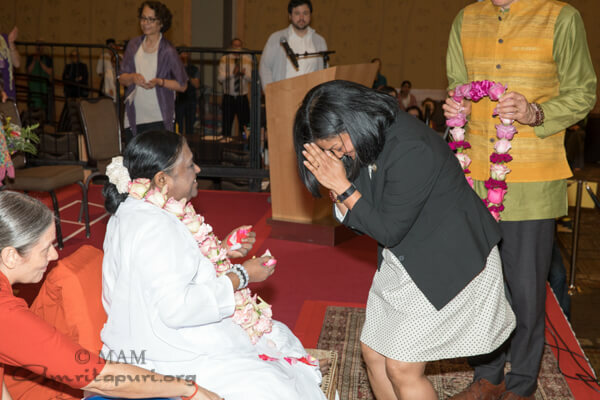 On the morning of the third day, US Congresswoman Pramila Jayapal welcomed Amma. 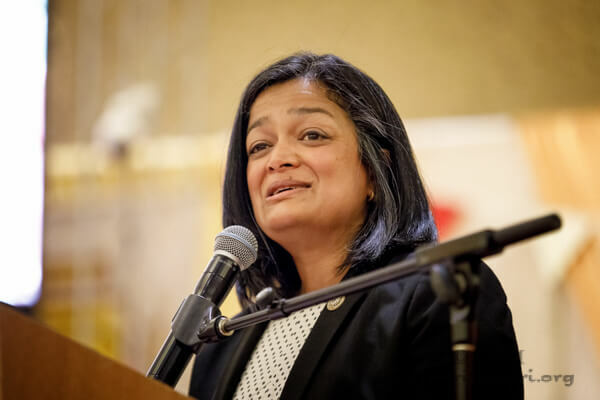 In her remarks, Rep. Jayapal said, “Amma’s message seems more important than ever before in these difficult and chaotic times when so much around us seems uncertain, when so much hate is exploding around us, and too many use their power for personal gain and without compassion for those who are most vulnerable.” Rep. Jayapal is the first Indian-American to serve as a member of the United States Congress. 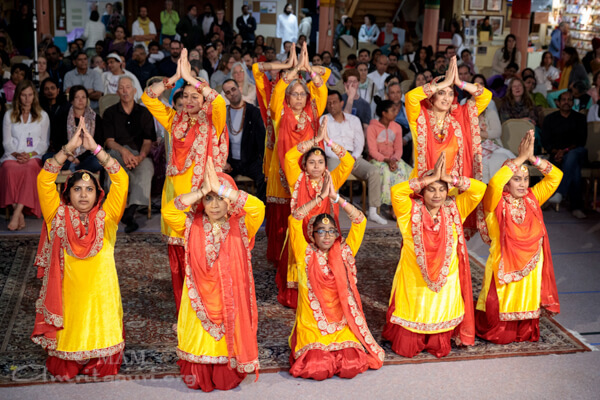 There were also numerous cultural performances, including a play depicting the scene of Krishna lifting the mountain Govardhan. 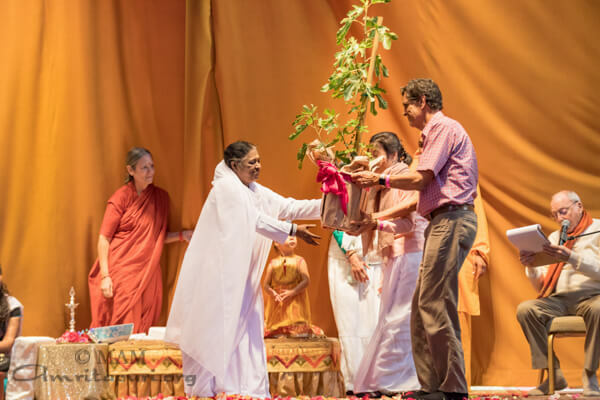 At the start of the Atma Puja for World Peace, Amma blessed two Rhododendron plants (the official state flower of Washington), which will be planted at the Pacific Northwest Center. 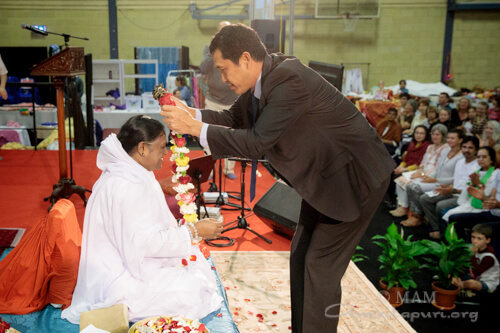 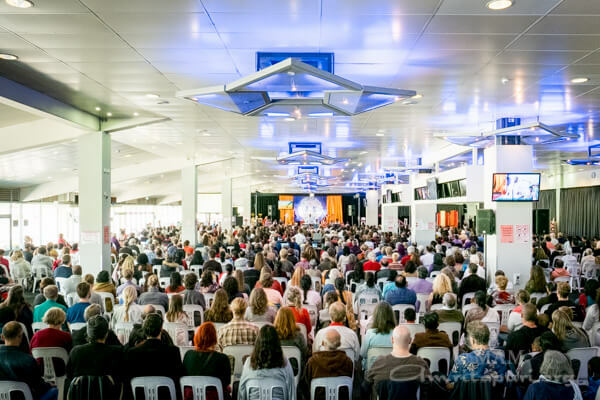 Amma visited four cities across Australia, holding free public programs in Melbourne, Sydney, Brisbane and the Gold Coast, and retreats in Melbourne and the Gold Coast in her 18 days program. 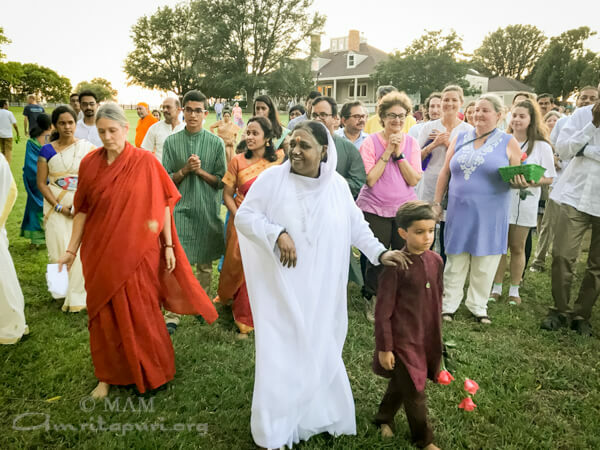 Amma traveled by road throughout the country, and the tour group enjoyed two precious stops along the way. 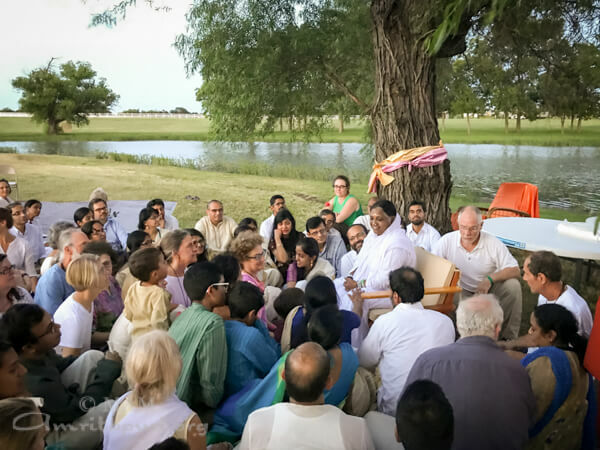 En route to Brisbane, Amma stopped at the beach and led a meditation as the sunset with the waves lapping against the shore just steps away. 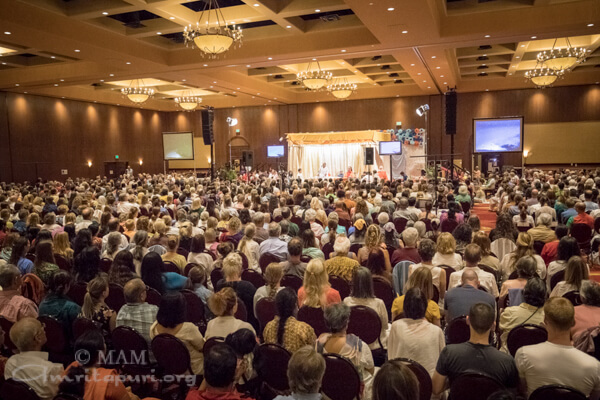 It was raining in the distance, and as the meditation concluded, a rainbow appeared in the sky. 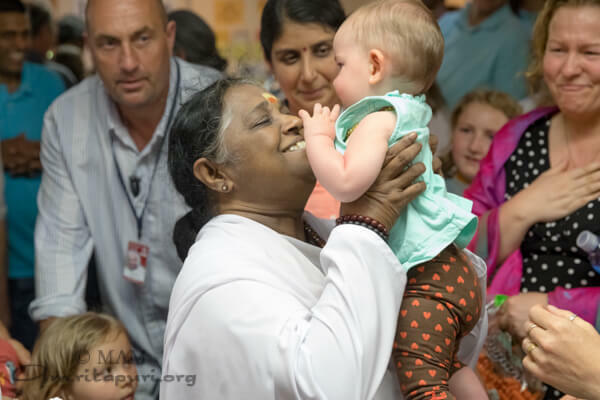 Amma shared the story of a little girl with a terminal illness, who faced her illness with equipoise and spent her days spreading love and joy to others. 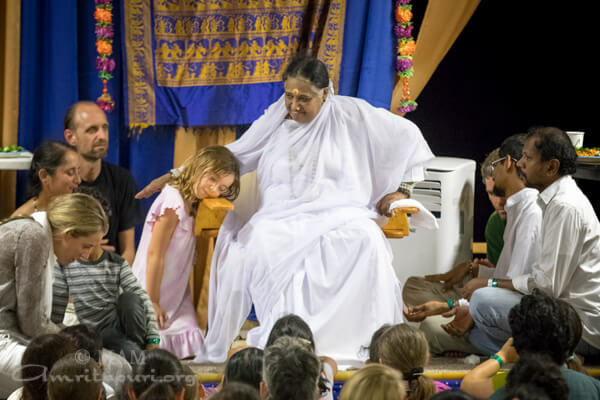 When asked where she found the courage to live her life this way, the little girl said that whenever she got discouraged, she thought of the rainbow: “Even though it exists for such a short time, it gives so much joy and happiness to others while it shines in the sky. 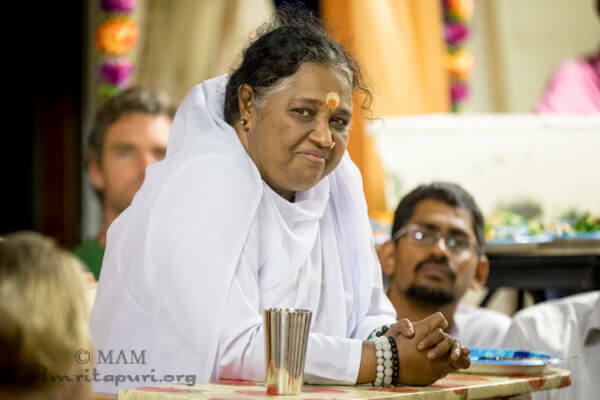 I want to be like that rainbow.” When Amma finished relating this story, she asked how many of her children also want their lives to be like a rainbow. 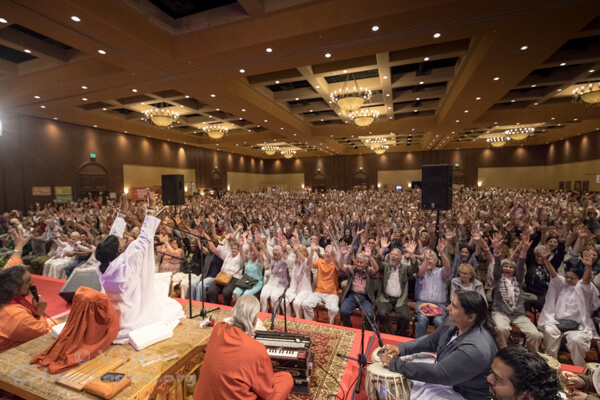 Hand after hand raised into the air, palms open and outstretched. 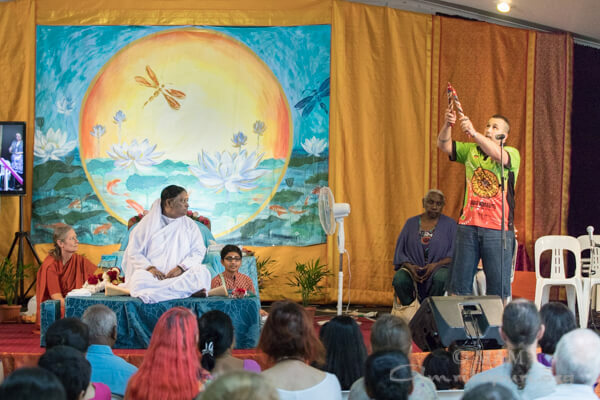 Meanwhile, it had begun to rain, and a second, even larger rainbow appeared across the horizon. 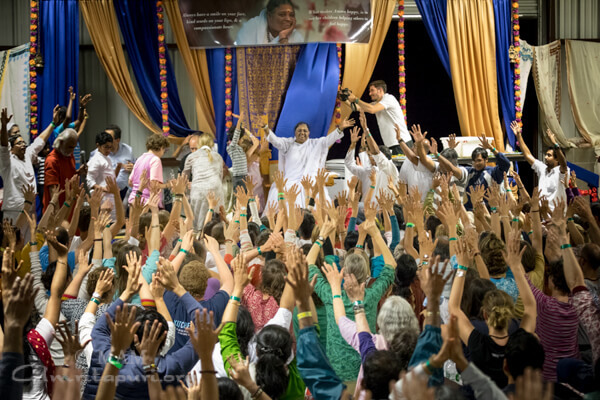 Finally, the rain turned into a torrential downpour, almost as if the heavens had opened up and were showering their grace upon all these selflessly-minded souls, each one inspired by Amma to lead their life dedicated to spreading joy and happiness like the rainbow. 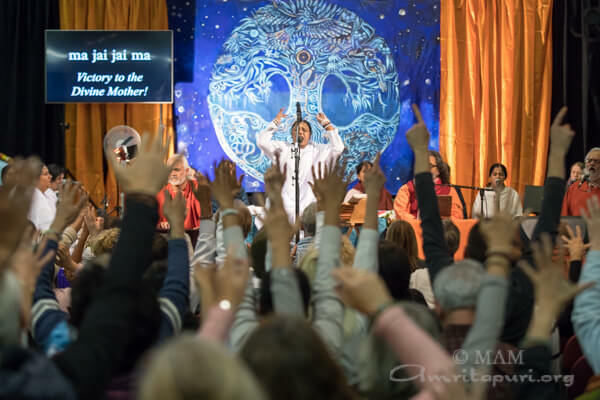 As the rain continued to pour down, Amma stretched her own arms toward the heavens and sang Srishtiyum Niye. 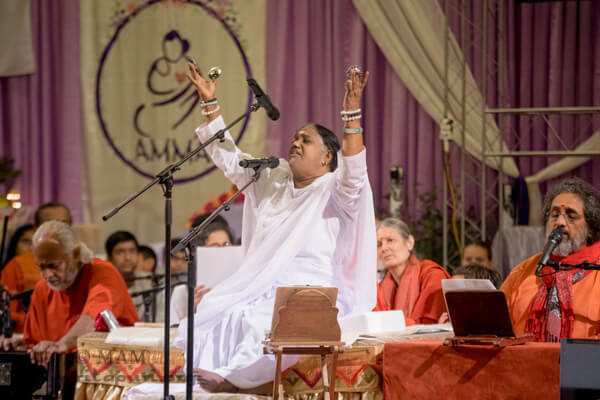 No one moved to take shelter, each one uplifted and transported by Amma’s soulful bhajan. 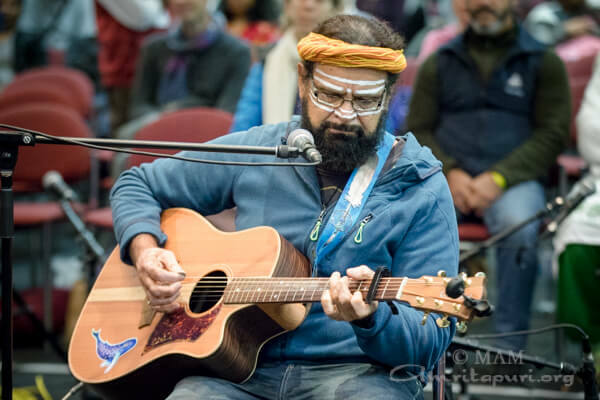 Goori wisdom from time immemorial does remain. 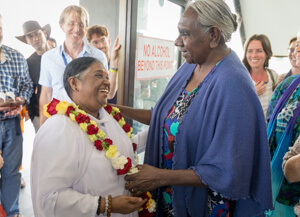 Finally, Amma was welcomed by Miriam-Rose Ungunmerr-Baumann, an Aboriginal elder from the Nauiyu community in the Northern Territory, a member of the Federal Government’s National Indigenous Council, and a Member of the Order of Australia for her outstanding achievements and service to Aboriginal people. 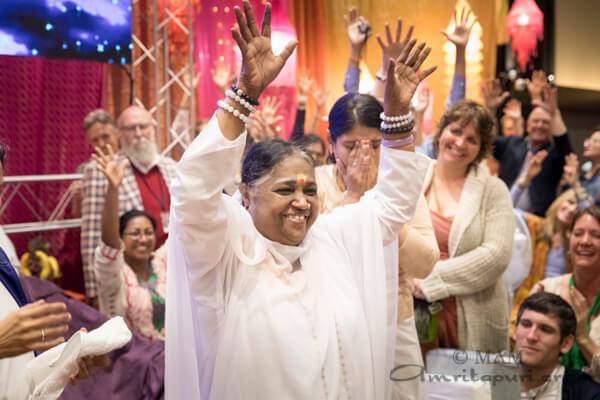 Miriam-Rose’s words were profound, and resounded through a hall that listened with pin-drop silence. 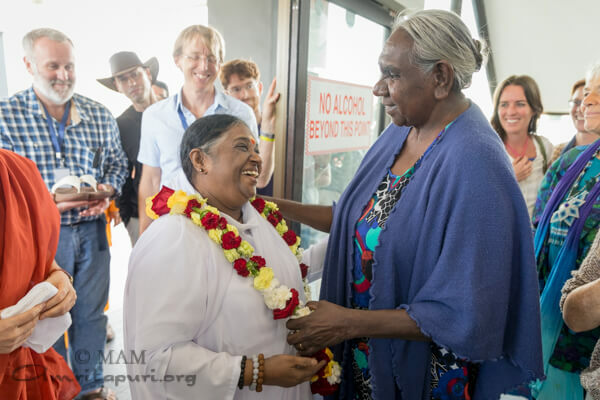 One couldn’t help but feel that she spoke on behalf of all of Australian’s native people, her voice imbued with ancient wisdom that recognized just how precious Amma’s visit, and Amma’s message, was for all the people of Australia and throughout the world.